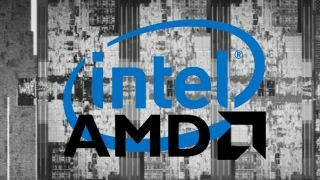 Intel and AMD may be processor rivals, but as we saw at the start of this week, they’ve got together to produce a new Intel Core H laptop CPU which will feature Radeon graphics – and benchmarks have just leaked showing the power of Intel’s chips which have integrated AMD GPUs. The reported benchmarks spotted in the wild – and remember, nothing is confirmed at this point – show a pair of quad-core ‘Kaby Lake G’ processors with integrated AMD graphics, the Core i7-8705G and i7-8809G, both of which have a base clock of 3.1GHz and boost to 4.1GHz. They sport integrated Radeon graphics with 24 compute units and 1,536 stream processors, 4GB of HBM2 memory, with the GPU clocked at 1000MHz for the lesser model, and 1190MHz for the more powerful i7-8809G. As TweakTown observes, the faster GPU will offer around 3.3 TFlops of compute performance, which, if you wanted to draw a comparison with consoles, is about half of the Xbox One X’s power (but much closer to the PS4 Pro which stands at 4.2 TFlops). Of course, raw TFlops is far from the best and universal unit of comparison for GPU performance, but we won’t go into that now – rather, this is about the story the leaked benchmarks tell. And there are plenty of them, with some highlights including a Geekbench OpenCL score of 76,607 for the more powerful i7-8809G, which unsurprisingly outperformed the lesser i7-8705G in 3DMark 11 achieving an overall score of 4,111 versus 3,879 (check out the full benchmarks here: Geekbench, 3DMark 11, GFXBench). Hot Hardware also spotted results for the Core i7-8705G in the Ashes of Singularity benchmark at 1080p resolution, with the processor hitting 53 fps at low details, and managing 33 fps with high details. In short, these CPUs show a more than impressive turn of speed, and do indeed look like they’re shaping up to be the most powerful integrated graphics solution going for the likes of thin-and-light laptops. And bear in mind that these benchmarks are still for prototype chips, too, so we could see even better numbers when it comes to the finished products. Promising indeed.